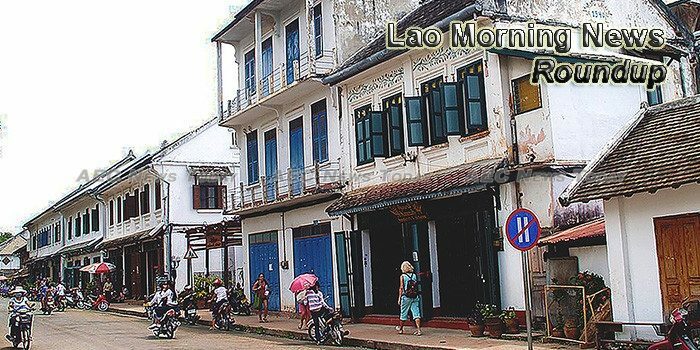 The economy of Laos grew at a rate of 7.02 percent in 2016, falling short of the 7.5 percent forecast in the plan approved by National Assembly (NA) last year, according to the Ministry of Planning and Investment. The third ordinary session of the National Assembly (NA) kicked off yesterday in Vientiane to review the government’s performance over the past six months, future work plans, socio-economic development plan implementation for 2016 and 2017 and law making. Isuzu is yet to have a plan to build an assembly plant in Laos but has said building one may possibly be studied if it is deemed feasible by a rising demand in the Lao pickup market. Laos’ gross domestic product last year saw a growth of only 7 percent, amounting to 108,605 billion kip (USD 13.27 billion) that was lower than the expected 7.5 percent, as a consequence of the global economic turndown, a decrease in copper prices and climate change. Lao Ministry of Agriculture and Forestry has signed a Memorandum of Understanding with China’s Xuanye (Lao) Co., Ltd/AVIC International Beijing Co., Ltd on a modern agricultural industrial park project in Laos. Lao Health officials are investigating a report that human sperm has been imported into Laos, local daily Vientiane Times quoted a senior government official as saying on Tuesday. Cambodia and Laos on Tuesday reaffirmed their cooperation to prevent border crime, including drug trafficking, but a recent military border dispute involving soldier surges and arguments over post construction was left off the negotiating table, an official said. The Ministry of Health confirmed yesterday that hospitals across the country ought to continue free treatment for all children while some local hospitals worry about their congestion and under-capacity. The Ministry of Finance has admitted that the government faced a deficit of government budget of over 950 billion kip in the first quarter of this fiscal year. The Lao government has so far focused on improving and solving some problems in national development over the last two quarters of 2016, leading to the success of many focal works. Minister of Interior Sar Kheng and Laotian Minister of Public Security Somkeo Silavong yesterday reaffirmed their commitment to increasing cooperation and security along their common border, despite recent standoffs between soldiers on each side due to a contentious road being built along the frontier. Food security and control in Laos has been boosted as the first official National Food Safety Laboratory opened on Monday in Vientiane, local daily Vientiane Times reported Tuesday. Malaria has been a public health problem in Lao PDR for decades but due to government and stakeholders’ efforts, malaria cases are now significantly reduced with sustained satisfactory levels according to the malaria elimination global health agenda, announced by the World Health Organization. The first official visit to Laos by Nguyen Xuan Phuc in his capacity as Vietnamese Prime Minister from April 26-27 is set to solidify the countries’ cooperation, which has been growing over the last 55 years.